The Earth’s moon rotates (spins on its axis), every 27.32166 Earth days. It revolves around the Earth in the exact same period – every 27.32166 Earth days. 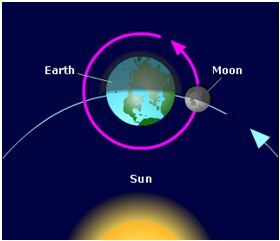 Because of the synchronization of revolutionary and rotational periods, the same portion of the moon’s surface is always directed toward the Earth. Have you ever heard the term the ‘far-side’ of the Moon? 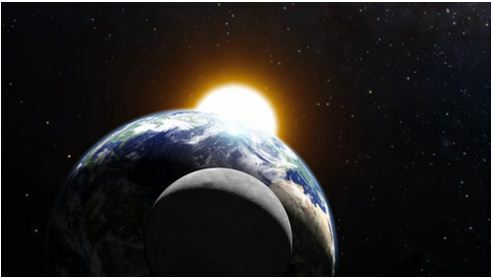 Because of the effect on the Moon of tidal forces due to the Earth, the same side of the moon always faces the Earth. In other words, it takes the Moon the same amount of time to rotate around once as it does for the Moon to go around the Earth once. Therefore, Earth-bound observers can never see the ‘far-side’ of the Moon. Tidal forces cause many of the moons of our solar system to have this type of orbit. The Moon takes about 27 days (27 days, 7 hours, 43 minutes, 11.6 seconds) to go all the way around the Earth and return to its starting position. A lunar month is the time the moon takes to pass through a complete cycle of its phases and is measured from New Moon to New Moon. 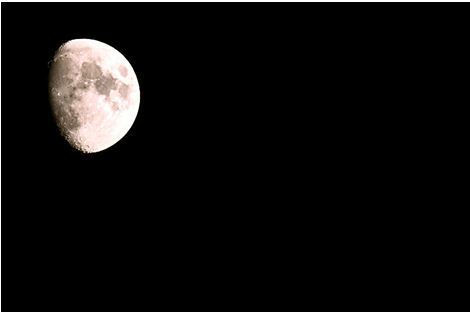 A lunar month is about 29.5 days (29 days, 12 hours, 43 minutes, 11.6 seconds). Whilst the Moon is orbiting the Earth, the Earth is constantly moving because it is orbiting the sun. The Moon therefore travels slightly more than 360 degrees to get from one new moon to the next. Looking down from the North Pole we would see the Moon orbiting counterclockwise from west to east. The moon rises in the east and sets in the west. The moon orbits Earth at an average speed of 2,288 miles per hour (3,683 kilometres per hour). The Moon travels at different speeds during different parts of its orbit. It moves slowest when it is at furthest distance from Earth. The Moon moves fastest in its orbit when it is closest to Earth. The Moon travels a distance of 1,423,000 miles (2,290,000 kilometres) around the Earth. The Sun is just one of about 100 billion starts in our galaxy. It has a DIAMETER of 1,390,000 kilometres! The Sun rotates on its axis once in about 27 days. This rotation was first detected by observing the motion of sunspots. 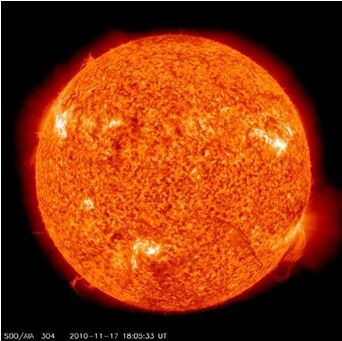 The Sun’s rotation axis is tilted by about 7.25 degrees from the axis of the Earth’s orbit so we see more of the Sun’s north pole in September of each year and more of its south pole in March. The same way that the planets orbit around the Sun, the Sun orbits around the centre of the Milky Way galaxy, taking 225,000,000 years to complete a full orbit, travelling at 800,000 kilometres per hour (kmph). 39. And the moon – We have determined for it phases, until it returns [appearing] like the old date stalk. 40. It is not allowable for the sun to reach the moon, nor does the night overtake the day, but each, in an orbit, is swimming. The Qur’an mentions more than 1400 years ago how the pattern of the moons orbit resembles an old date stalk. The moon, unlike other satellites, does not follow a regular orbit. It orbits behind Earth and in front of it in an “S” shape. If we analyze the two images below, we notice how well the description of the Qur’an fits into the actual phase of the moon. Knowing this over 1400 years ago, by Rasul Allah (صلى اللهُ عليهِ وسلم), when there was no modern technology, proves the miraculous nature of the Qur’an. “To complete one revolution on its own axis, the galaxy and the sun take roughly 250 million years. The sun travels roughly 150 miles per second in the completion of this” (The Bible, the Quran and Science, p. 162). When the Qur’an was revealed, it took years for early commentators to conceive the orbit of the sun and the moon. The tenth century commentator Tabari could not explain this so he said, “It is our duty to keep silent when we do not know” (XVII, 15 quoted in The Bible, the Quran and Science, p. 161). “This shows just how incapable men were of understanding this concept of the sun’s and moon’s orbit.” (The Bible, the Quran and Science, p. 161). From this we learn that the Qur’an was presenting a concept which was completely alien to people at the time it was revealed and for many years to come after it. It is only today that this concept has been fully comprehended with the help of technology. This again affirms the truth of the Qur’an and the Prophethood of Rasul Allah (صلى اللهُ عليهِ وسلم). Is it purely coincidental that the moon rotates on its axis in synch with its revolution around the Earth, keeping the same face always pointed toward us? This entry was posted in Reflections, Signs in the Universe and tagged Allah's Creation, alternation of night and day, creation, miracle, moon, Quran, signs, sun, universe. Bookmark the permalink. This reflection is very nice since it tells about the creation of the sun and moon also it’s importance. We should be grateful for the creation that Allah has created for us and how should we be grateful for the blessings that Allah has created for us.